"Sgt. Lalonde & Sgt. 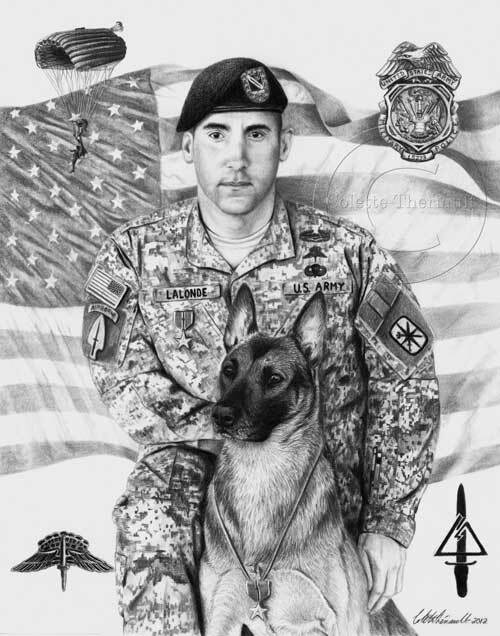 Major Fasco"
This commissioned custom drawing features Military K-9 Police handler Sgt. Chris Lalonde and his dog U.S. Army Sgt. Maj. Fasco. The pair participated in a historic tandem jump from a CH-47 Chinook helicopter at an altitude of 12,500 feet, Sept. 18, 2009. The jump took place at the Gammon Parade Field on Fort Leonard Wood, Mo. during Military Police Warfighter Week.